← #UNRIG — Why You Should Join the 2nd American Revolution! In the month since Southern California Gas Company got the green light to refill its underground gas storage field near Porter Ranch, airborne monitors have detected at least two spikes of methane in the skies above the Aliso Canyon facility, state regulators say. The storage field was the site of the nation’s largest uncontrolled leak of methane, releasing 109,000 metric tons of the potent greenhouse gas into the atmosphere over nearly four months beginning in late October 2015. 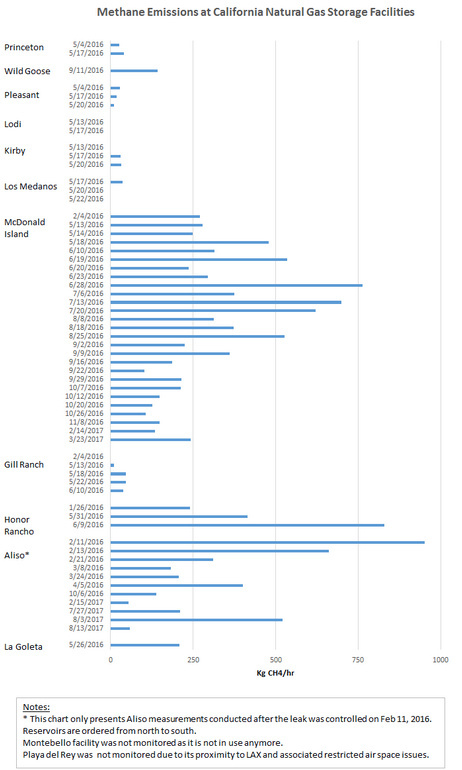 But even after an extensive maintenance overhaul, the air above the facility has seen sporadic spikes in methane, according to data posted by the state Air Resources Board. Some amounts emitted were the highest recorded by methane-measuring aircraft since the the leak was plugged in mid-February 2016. Since SoCal Gas began refilling the underground storage field Aug. 1, state-ordered flights to measure methane showed two spikes hitting double the level the state had set for the company to avoid further airborne monitoring. In a July 19 order, the state Divison of Oil, Gas and Geothermal Resources (DOGGR) requires the methane-measuring flights to continue — at SoCal Gas expense — until emissions remain under 250 kilograms per hour. The two airborne readings over 500 kilograms per hour indicate methane is escaping from some source at the gas field, said Jorn Herner, chief of emission mitigation at the state Air Resources Board. But he cautions to keep the amounts in perspective. “How does that compare to when the leak was happening? It’s about one percent of that,” Herner said. At the height of the gas well blowout, between October 2015 and mid-February 2016, the field was emitting 35,000 kilograms per hour, according to the Air Resources Board. He also said variable wind patterns and other sources of methane in the area can compromise the accuracy of airborne monitoring. Methane has been shown to come from oil-drilling rigs operated by other companies in and around Aliso Canyon. The Los Angeles County Department of Public Health reports that complaints of gas odors have increased sharply in the month since the gas field resumed operations. The department received six reports of gas-related health complaints in the ten days before the field began to receive new gas injections, and it’s gotten 35 since Aug. 1, said Angelo Bellomo, deputy director for health protection. What have the methane-measuring flights over Aliso Canyon found? There have been four flights to measure methane over Aliso Canyon since the state cleared the field to receive new gas injections. The order permitting SoCal Gas to refill the gas field required one flight to measure methane before the injections started and two flights after. More flights are required if methane levels over 250 kilograms per hour are found. July 27: This flight was intended to gauge the amount of methane coming from the gas field before injections resumed. The reading surprised the experts, coming in at more than 1,000 kilograms per hour. 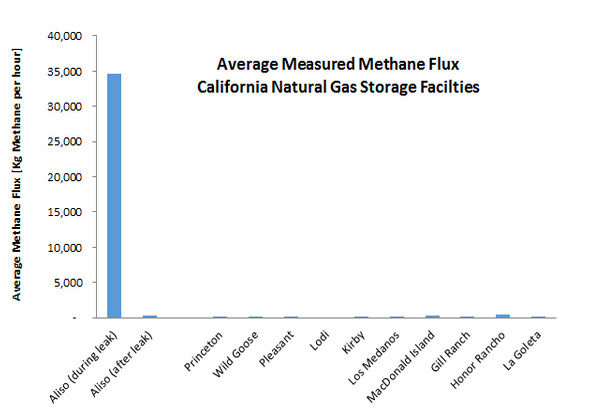 However, after examining the flight path of the aircraft, wind patterns and the location of other methane-producing sources, the amount of methane attributed to SoCal Gas was cut to less than 250 kilograms per hour, Herner said. Other sources of methane in the area could be the adjacent oil drilling operations, which produce natural gas as a byproduct, and the nearby Sunshine Canyon Landfill. Herner said inspectors from the South Coast Air Quality Management District found the source of at least some of the excess methane. It was coming from a parcel northeast of SoCal Gas’ Aliso Canyon property where The Termo Co. has wells that produce oil. 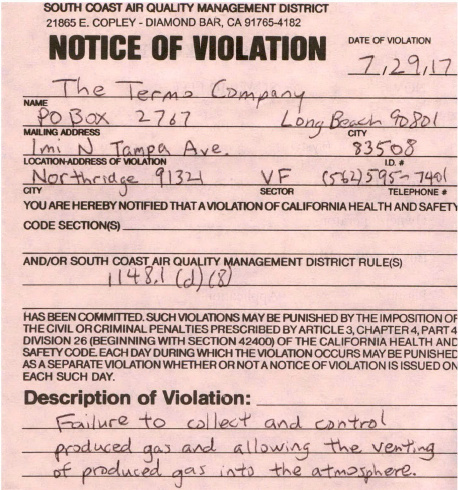 An AQMD inspector issued a notice of violation of air quality rules to Termo on July 29. Termo executive Ralph Combs declined to comment Tuesday on the notice of violation. Termo is the company that was cited last year for venting natural gas illegally. Company staffers were accused of having routed an exhaust line from its oil equipment to some bushes 300 feet away. The venting was discovered by a methane-measuring flight while the larger gas leak was active. The company is in settlement talks to reduce a proposed $75,000 fine from DOGGR, said spokesman Donald Drysdale. Aug. 3: The second flight occurred three days after new gas injections began and followed a different pattern from the first. It showed a methane reading of 530 kilograms per hour, more than twice the target level set by the state. The aircraft flew in tight circles at various elevations above the gas field to avoid outside methane sources that were not part of SoCal Gas operations, Herner said. AQMD responded to the high reading by sending inspectors with hand-held methane detection equipment, said Andrea Polidori, atmospheric measurements manager for AQMD. An agency staffer also drove a car-mounted methane monitor on the hilly roads around the gas field. But the search for a methane source came up empty. “On the day when the aerial measurements measured about 500 kilograms per hour of methane from that facility, we actually did not find elevated levels or greatly elevated levels of methane with our mobile measurements,” Polidori said. The team also measured the methane levels in neighborhoods near the gas field and found no unusual levels, Polidori said. Aug. 13: The third flight showed a lower reading, less than 100 kilograms per hour. That was within the 250-kilogram-per-hour standard the state has set. Aug. 17: This flight showed a reading of 570 kilograms per hour. That reading means SoCal Gas must continue funding the methane detection flights until it has two consecutive flights that come in below the state target of 250, Herner said. Another flight is expected to re-test the air over Aliso as early as Monday. What’s it mean to residents to have a 500 kilogram/hour methane reading? Herner said that kind of reading might add only .15 parts per million of methane to neighborhood levels that are typically at a background level of 2 parts per million. “It’s very little compared to what’s already there,” Herner said. When the leak was active, levels of 50 to 60 parts per million were common.